Western blot analysis of whole cell lysates probed with A-FABP antibody (VMA00240) followed by detection with HRP conjugated Goat anti Mouse IgG (1/10,000, STAR207P) and visualized on the ChemiDoc MP with 5 second exposure. Arrow points to A-FABP (molecular weight 14 kDa). A-FABP4 antibody recognizes fatty acid-binding protein, adipocyte, also known as adipocyte lipid-binding protein, adipocyte-type fatty acid-binding protein, epididymis secretory protein Li 104 or fatty acid-binding protein 4. Mouse anti Human A-FABP antibody recognizes the fatty acid-binding protein, adipocyte, also known as adipocyte lipid-binding protein, adipocyte-type fatty acid-binding protein, epididymis secretory protein Li 104, fatty acid-binding protein 4 and fatty acid-binding protein, adipocyte. Encoded by the FABP4 gene, A-FABP is a fatty acid binding protein found in adipocytes. Fatty acid binding proteins are a family of small, highly conserved, cytoplasmic proteins that bind long-chain fatty acids and other hydrophobic ligands. It is thought that FABPs roles include fatty acid uptake, transport, and metabolism. (provided by RefSeq, Jul 2008). 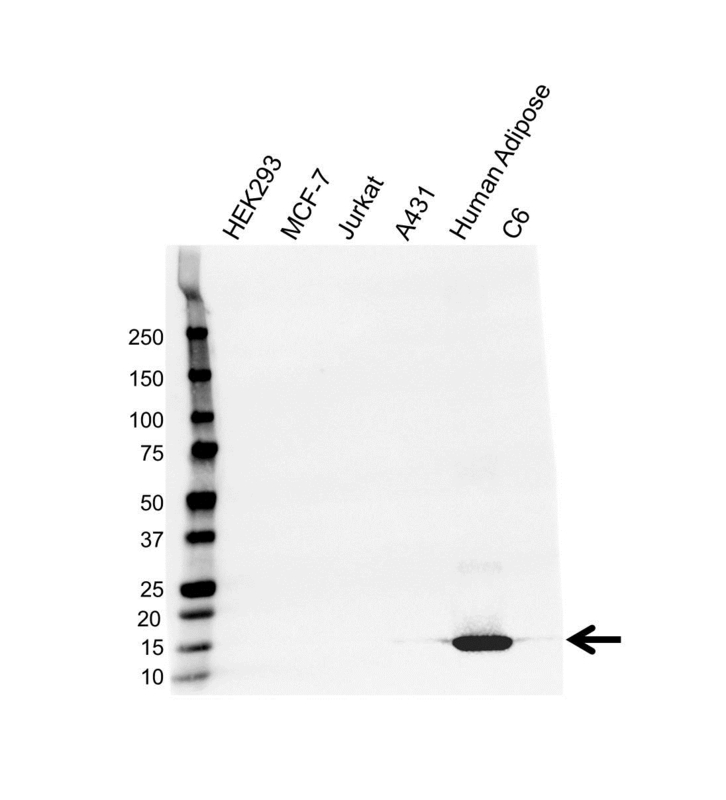 Mouse anti Human A-FABP antibody detects a band of 14 kDa. The antibody has been extensively validated for western blotting using whole cell lysates.